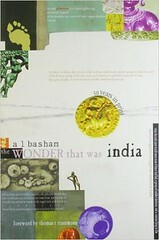 'The Wonder That Was India' is a book of history intended for the audience of Western countries. Because of this, we find numerous references to legends, myths, and kings of the western world, so that the intended audience can correlate with the corresponding piece of Indian history. There may be references to few unknown events or figures for an Indian reader who is not well aware of Western history. This book builds on the theories of Indologists who started their work after the colonization of Indian subcontinent. As India, Pakistan, Bangladesh, and Srilanka share a common history, the contents of this book can be read for all these countries without losing context. The author of this book, A. L. Basham has covered Indian history from the pre-historic times to coming of Muslims in Gangetic Plains which took place roughly around twelfth to the thirteenth century. The author of this book staunchly believes in Aryan Invasion Theory. Although a prevalent theory in 1965, when this book was first published, there have been few developments in this area, already a touchy issue for Indians. Recent research papers have shown that genetic patterns are mostly similar for all Indians. Few others have argued that language alone cannot be used to prove conclusively that there was Aryan Invasion. If there was an invasion it must have left a bloody trail of destruction, which is nowhere to be found. Presently, scholars continue to be divided on this topic. Whereas another history book, 'India : A History' by John Keay presents both views and lets the reader decide, this book can be noted in its steadfast belief in Aryan Invasion Theory. The structure of this book is quite different from other history books. Whereas in other history books we find only a description of events occasionally glorifying and vilifying persons, this book stands out in that it only gives three chapters for the events. Rest of the book describes statecraft, daily life, religion, language, and arts. All these sections are detailed and in chronological order and present the development from Vedic period to middle ages in an area, say language. Thus we can see gradual changes in the topic presented. While describing statecraft of Vedic people, the source seems to be Vedas and the commentaries on Vedas written centuries after. Few ideas of statecraft can be seen from rock edicts of Ashoka, a replica of which can be seen at the National Museum of New Delhi. Basham says that initially, the Rigvedic tribes have their tribal lords referred as 'Rajanya', future model for Raja, the King. As old tribal setup was breaking and power of the state was consolidating, a sense of pessimism was set in the minds of the people and thus arose asceticism. Kingdoms after Mauryan Dynasty struggled to keep the subcontinent united and continued bickering among themselves. As far as religion is concerned, Basham goes with the concept gaining currency that the religion during the time of Vedas was different from later Hinduism and thus can be addressed as Brahmanism or Vedism. Many of the cruel sacrifices were stopped in mainstream Hinduism. With the growing popularity of Buddhism, Jainism, and other heterodox sects, many of the concepts propagated by these sects were later assimilated into Hinduism such as idol worship, vegetarianism, and asceticism. In the book, the philosophies of the Indian religions have been discussed in quite a detail and many schools of thought have been given representation. With the existing literature from the historic times, attempts to illustrate clearly the culture and society of the ancient times have not been satisfactory to the scholars as most of the literature from the ancient times has been ornate and decorative. Kings, Gods, and sages have been so glorified that it has been difficult to picture them existing in real. Another thing which can be noted is the difference between the life presented in scriptures and that in sculptures. It can be reasonably concluded that the artists were more of a free mind. The chapter about language is devoted to the development of languages. Almost all North-Indian languages can trace back their roots to Sanskrit and those in South India to an ancestor of Tamil. Sanskrit very early ceased to exist as the language of masses and this led to the development of vernaculars that we have today. This book contains many references to Sanskrit hymns which are quoted after translation to English, although at many places the original version has also been given. While translating those lines in English the original beauty of those lines has been lost as the author has also admitted at few places, but then this book was intended for the Western audience so the author can not be blamed for that. The chronological order of chapter has sustained the interest and presented the transitions smoothly. At many places, it was felt that space is too little even for such a detailed book to present many legends such as those of Buddha and Krishna. The popularity of this book can be seen in the fact that the second part of this book was released which was authored by S. A. A. Rizvi covering the period from coming of Muslims to British Conquest. You have picked a great topic to write about. India has many stories to tell. We were always a main center of attraction to the outsiders. Our country has given birth to many personalities. I will for sure read this book.